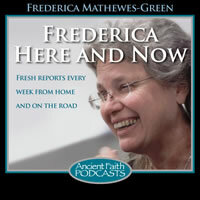 Frederica reflects on giving to the needy, countering the cultural beliefs that the poor have nothing to offer, that it is okay to be consumers and not producers, that we must despise the wealthy, and that charity must go through an established organization. The poor in many other countries often rely on skills handed down to them by their ancestors. But what about the poor in America? Frederica questions the wisdom of giving to the poor without asking any questions. Frederica tackles "the problem of evil" in an essay that was originally written for Beliefnet. I wanted to say a few words today about social justice and serving the poor and those requirements that are laid upon us as Christians, mostly because I feel like the way I see that whole matter is so different from the popular way that it is viewed. I feel very much out of step with my times. So I’m going to venture out there with an opinion that may well be shocking for all I know. Among the many things I’ve noted and that kind of bother me is, for one thing, we often hear a distinction between: there are people who are prayerful and people who are active, people who are contemplative and they’re the Marys, and then there are the Marthas who actually go out there and do good works. It’s as if these are two separate categories of people. I think that’s false; I don’t think that’s the case at all. It seems to me that the most prayerful among us are the ones with the most tender hearts, who are reaching out and helping people. I’m going to talk more about that in a later, shorter podcast. I think part of the problem is that our culture today has this view: [that] people who are needy in a material sense [are viewed] differently [from] people who are just needy and wounded and hurt and who need care and who need love. People who are extremely wealthy and extremely powerful can still get cancer, can still have a child die. They can still wrestle and struggle with their faith and feel like they don’t feel the presence of God any more. These are genuine needs and should attract our compassion and our care and our prayers. It’s not like, just because they happen to be wealthy, that we should have contempt for them. Wealthy people are not necessarily bad people, bad Christians. I think we need to view them… The rule about not distinguishing between the poor and the wealthy has this corollary, which is: we don’t despise the wealthy. They are our fellow brothers and sisters, too, so that we should embrace them. We should be blind rather than thinking that the poor have an exalted status and just reacting and reversing a previous preference for the rich that was not healthy. Don’t go to the opposite extreme, but just try to love everybody. I think that’s kind of a shocking thing to say. Another thing that bothers me is that, as I read the Scriptures and sort of read through the history of the Church, it seems to me that there is positive, genuinely, that there are these two different camps: there are the powerful and there are the weak and the needy. As I said, we don’t despise the wealthy. Just the other day, I had the thought that the Theotokos, the Virgin Mary, was the daughter of a wealthy household, that Joachim and Anna were extremely well-to-do, and that’s the whole beginning of the story of the Virgin Mary’s conception, that Joachim gave abundantly. He gave not only for himself, but he gave sacrifices for all the people and for the sins of the people. He was extremely generous, as the wealthy faithful are apt to be. So the Virgin Mary did not grow up in a poor household. She actually was the daughter of a very wealthy couple, although from the age of three she was growing up in the temple instead of in her home. So we should not despise the wealthy. In that kind of in-the-middle position, you tend to run in circles, sometimes feeling guilty, sometimes feeling deprived. A way of resolving that is to really focus on how much you care about the poor, to think of yourself as someone who defends the poor and stands for the poor, who is not poor but identifies with the poor in some of their spiritual elevation. We see the poor as being spiritually higher and more exalted. Some of that rubs off on us because we identify with them. But I think this is kind of an artificial category that we have developed, perhaps because of a sense of guilt, but it’s kind of a new thing, this middle stance, where you’re neither poor nor wealthy, but you see yourself. You’re very aware of this self-identity, of being an excellent, pure, and wonderful person who is identifying with the poor. Sometimes when I’m in situations when I have to attend worship among mainline Christians, I find this very wearying, that so many of their hymns are about how great we are because we care for the poor. It’s not really even about God; it’s about this excellent role of being defenders of the poor. It’s so self-conscious and so self-congratulating that it’s very tiring for me to be around. I think another factor of our current attitudes in our culture in our generation about social justice that’s sort of troubling to me is that we see the needy as only recipients, as if they have nothing they can give; there is nothing valuable that the poor can give to us or to anyone else or even give to each other. They can do nothing except… It’s like they’re just lying on a hospital bed, receiving an IV, receiving an infusion. All they can do is take. There’s nothing valuable that they can give. We would never dream of asking them to give. A hundred-something years ago in American charities, if a poor person came into a home to spend the night, a home that was established to shelter and give care to the poor, they would be expected to provide something and to give something, to give labor. An old woman maybe could only sit in a rocking chair, but she could knit a blanket that then later might cover a strong young man who needed to stay in the shelter, but who would be outside in the afternoon chopping wood for the fireplace and for the furnace. At night he could be covered by that blanket. I think there’s something actually more respectful of the poor if we understand them as people who have something to give and who are able to give, [otherwise] it’s very debilitating. I think a stream of disability in our culture that really undermines people’s senses of themselves at all economic levels is seeing ourselves as consumers rather than producers. We identify with “I like this kind of music,” “I like that kind of movie,” “I drive this kind of car,” “I like this kind of cooking.” It’s all just taking it in, gobbling and gobbling, more and more inwards. You know there’s some point at which you think, “I don’t produce anything. I have nothing of value to give. I can just spend money.” I do think that this is disabling, to see yourself that way, and I don’t think it’s healthy for us to treat the needy that way. I recently read an article that said, “Think about what percentage of your time you spend producing something that other people want or that other people could use, and what percent of your time do you spend consuming things that other people produce.” It’s a kind of a pointed question, an uncomfortable question. I think one of the reasons this is such a big thing, this big invisible wall in our culture, that we are consumers rather than producers, has to do with the fact of our economy and advertising. Advertising is an extremely persuasive medium, and they spend so much more time and money on a thirty-second commercial than they spend on the one-hour or thirty-minute TV show that you’re watching that the commercials are embedded in. They think so deeply about psychology and how to persuade you, but they’re all about getting you to consume stuff, so the act of consuming becomes much larger in our awareness than the act of producing does. Many of us, even in our jobs, we’re not sure what we’re producing is of value to anybody. Or maybe we don’t have a job that has anything to do with producing things. In our waking life, there is a great imbalance, and I think advertising continues to kind of blind us to it and make us think about how excellent it is to be consuming this great stuff and how great it makes me look, that this is the brand that I consume. I think it doesn’t help the needy for us to perpetuate that upon them and to treat them as only consumers who have absolutely nothing of value that they could give. They are defined by being needy. They are defined by being black holes that we pour stuff into. I think it’s much healthier if they have a way to give. I think it’s called Gresham’s Law that “bad money drives out good money.” I have a friend who used to say that “bad charity drives out good charity,” that if all the other social services in a city are just pouring stuff out the door for free with no requirement to give in return, if you try to set up the lone charity that’s going to actually take them seriously as human beings who have things they could give, they won’t come to you! “Bad charity drives out good charity.” They’re going to go to the one that’s giving away stuff for free. I saw this recently in a charity that I visited, and the director was saying, “We had a terrible time about six months ago. We ran out of coffee. We didn’t have any money to buy more coffee, so our clients were saying to us, ‘You’d better get more coffee, or we’re going to go to a different charity, a different storefront, and spend our time there instead of here.’ ” It just kind of sounded wrong to me. Anyway, that’s another one of my points. Another thing is that, so often, we are not in a relationship with the poor that we give to. We give “to charity,” and we maintain a distance between ourselves and the ones who are really in need. This state of affairs comes about because it’s phenomenally more efficient. It’s so much easier for everybody to pool their money, and then you have an expert who divides it up and gives it out—but what a gap there is between us and the needy. Certainly for most of human history, certainly for most of Christian history, money or goods were given within a relationship. You wouldn’t need an organization. Of course, this does still happen in our churches, where there’s a family that is poorer than your family, they have a disaster, their house burns down, something like that, so you go through your pantry and you bring out food and you give them the food. Or you bring around meals every night for a week, everybody divides up the work. That kind of giving was really the main kind of giving to those in need for most of Christian history. We have now changed over to a model of having organizations that are go-betweens, that are in the middle. They do the relating for us. I think we lose something in that, in accepting that that is the normal way that charities ought to work. For most of Christian history, of course, it was the deacons that were in charge of this, so it was kind of an interim thing which is: within your church, you would give your ten percent to the Church, and the deacon taking in all of this, knowing where the needs were, [was] actually serving the Church first. So often what St. Paul and the early writers talk about is giving for people who actually attend your church and are in your Christian community, or for Christians who were from out of town, but they’re traveling, they’re journeying, but you take them into your community and provide for their needs. In the first three centuries, of course, the Church was very, very poor. It wasn’t able to give very much beyond the boundaries of the parish, but that strong, strong emphasis on giving actually had to do with giving within your worship community. And because maybe it was a big church and you couldn’t know everybody, and it’s not really appropriate for you to know all the needs in other families, the deacon was the go-between. But that still is a far cry from the anonymity of writing a check to an organization you approve of and them giving away the money elsewhere, with absolutely no knowledge of how that’s being [given], of [whom] that’s being given to. In my own [life], my husband and I, back when we were still in the Protestant seminary, long before we dreamed of becoming Orthodox, we were convinced that the Biblical tithe is the expectation, where it says in Malachi, about “bring the full tithe into my storehouse and see whether I will not open the windows of heaven and pour out a blessing on you.” “Bring the full tithe to my warehouse,” that means give the full ten percent to the Church, and my husband, Fr. Gregory, and I have done it for 40 years now. We took that very seriously. Ten percent—the top ten percent—of everything that we earn goes to our local parish. We’ve always done that, even when we were just getting by on a shoestring, making $40 a week cleaning, being janitors at a church, going once a week and doing janitorial service; we put four dollars in the plate, and we were blessed. During those seminary years when we were so poor, there were a number of times that we would go to the bank—this is before ATMs: you would give over your bank book for your savings account, and they would stamp it with how much money was in it, how much you’d deposited—there were a number of times that we had found mysteriously an extra $50 had been deposited in our savings account. Nobody else would have had access to this. So that was a reward and an encouragement to us, putting our little four dollars in the plate and being blessed so abundantly in return. There was a period of time when we took that ten percent and we divided it, half and half, five to the church, five to charity, but after a couple years we were convinced that “bring the full tithe into my storehouse” really meant ten percent to the church, giving above that to charity. So since then we have sometimes been able to range up to an additional ten percent to charities, an additional ten percent to the poor: ten to the church, ten to charity. Sometimes it’s been as low as five percent in addition to the ten to the church; it’s ranged around in there depending on how well we were doing in any particular month. At present our charitable giving… I like to give to people I know. We support the mission, the Orthodox mission in Pakistan, an Orthodox mission that is near us in a neighboring city, the OCMC (Orthodox Christian Mission Center) has a program called “Support a Mission Priest,” and we give to that. That’s one of our larger givings every month, is to support priests who are starting missions in Africa and all around the world. We can learn about those particular priests through OCMC and know exactly what their church is like and what they’re doing. When I see what it is like for them and what it was like for myself and my husband when we were founding Holy Cross Church, when there were only five families in our church in addition to our family and we already had so much more than these mission priests do, [I know] that’s an important place of giving for us: the “Support a Mission Priest” program that the OCMC offers. Finally, all these things I’m naming, they’re all missions. These are giving to missions so people can know the Lord Jesus Christ. This is something that has become very controversial. Many people believe that you should not involve your faith in any way in your giving. I understand that with IOCC, the International Orthodox—now I’m not going to remember what “CC” stands for—[Christian Charities], their mission is more like the Red Cross, and they receive monies from the U.S. government, from other sources. They go to lands that have historically had a large Orthodox population, but they don’t have any test for those they give to. They give to Muslims, they give to people of all different religions. The IOCC has that mandate, and I understand that, but I don’t think we should say that it is wrong to preach Jesus Christ to the poor. I think that should be a component, that we should give evidence of our life, that we should show that we are Orthodox Christians. I think we should keep in mind that it is good when we talk to those who are in need or who are poor, [whom] we are giving to, that we should preach Christ to them, and I know many people think that is wrong and you should never say that. But I think the shocking part of this is that I believe the poor are sinners. I think we’re all sinners, that you’re not automatically sinless because you have suffered. Suffering does not make you sinless. Being poor does not make you sinless. Nobody is sinless. We all need Jesus Christ. We may be able to give a lot of different material goods by God’s blessing. We may be able to give a great deal, but all that is worthless compared to salvation in our Lord Jesus Christ. What account will we have to give on the Last Day if we say, “Yes, we gave money and furniture and shelter and food,” and the Lord will say, “But you didn’t teach them how to be saved. You didn’t teach them how to being the path of theosis. You didn’t teach them how to overcome their passions.” All of those things that we expect of others on our economic level and in our social group that we see the urgency of, I think we need to see that as urgent for the poor as well, or else we are withholding the one thing needful. As our Lord said to Martha, “Mary has chosen the good portion,” the portion of clinging to him, listening to him, receiving his life, becoming one with him. That path of theosis is the calling for every single human being alive, not only for Orthodox Christians, not only for Christians, not only for well-to-do Christians who have the leisure to read books, but for all of us. We shouldn’t be withholding that from the poor. Those are some really controversial ideas that I have, and I just wanted to spend a little time talking about.